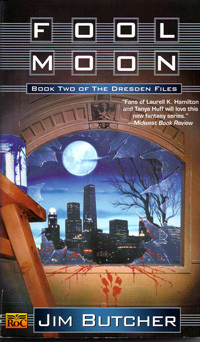 Fool Moon is the second of the Dresden Files books. This book starts by reintroducing a common theme, Harry withholding information. In this case a sometimes student of his wants information on a specific magic ritual, Harry refuses out of fear that she cannot handle it. Like many of Harry’s decisions this one comes back to haunt him later. Although initially brought into a police investigation as a consultant he is eventually arrested on suspicion of withholding information. He escapes, but continuously comes back into contact with the police and Murphy as he looks for a way to save the day and himself. The book deals with werewolves and is the introduction of a minor group of characters who call themselves the Alphas. They are college-aged kids who discover they have a little bit of magical power. They use this power to shape shift into wolves. The Alphas will reappear throughout the series as backup for Harry in precarious situations. Harry and Murphy’s relationship reaches high tension as Harry withholds some important information from her and the Chicago Police Department for which she works. It is also in this book that Harry begins a romantic relationship with reporter Susan Rodriguez. This relationship will shape Harry’s interactions with the world for many books to come. While similar in style to the original, this book shows clear improvement from Jim Butcher. The pacing is a lot better. In Storm Front you could see the beginnings of his pacing style, basically ending each chapter with something big. Sometimes Harry might discover a clue. Sometimes a bad guy might show up. The key is that Butcher usually leaves you wanting to read just one more chapter. The Dresden Files books are hard to put down. Fool Moon improved greatly over Storm Front and this pattern will continue in the rest of the Dresden Files books.